Did you know that there’s a skeleton inside of your body right now? Some say it’s mostly harmless. Others say it’s actually waiting for its big moment when the skeleton war finally breaks out. We say you can’t be too careful -- launch a preemptive strike against the spooky skeleton inside of you right now. Stop drinking milk. Take up skateboarding. Start cracking your fingers. Just do anything to give yourself an advantage if the day comes when your spooky skeleton turns against you. If you’re looking for one of the most blood-curdling decorations on the Halloween market, look no further than this ghastly, bony abomination. 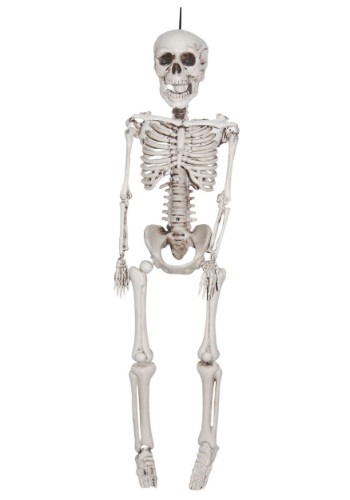 At one foot tall this funny fellow is anything but -- he’s a calcified, grinning menace, just hanging around until it’s time to rattle some rib cages!